Of course, no one knows that the reason I did not blog in September or in October was because my Dad got sick and died in September. My brother and I were with him: his body would not respond to treatment, and he slowly slipped away peacefully, without any struggle, according to God’s will. But, God was with us. During my time with him, I had placed a Miraculous Medal on his bedside table to help him in the case he was going to go on a spiritual journey to God – and to keep him safe. He was still an intermittent Episcopalian, and I had no idea about the state of his soul. I figured that it would be an aid, in some way, a draw of divine favor from God if he needed it. Interestingly, I found it about a month earlier laying on the ground. I had no idea what to do with it. I kept it in my pocket looking for an opportunity to give it to someone in need. And this is where the need was fulfilled. Two days before he died (it was the anniversary of his own Dad’s death), in the morning, we saw great signs which gave us hope that he would heal and come back. Treatments were working, he felt better, he ate some, he walked around, and he had lucid conversations with us. He looked deep into my eyes twice and told me how much he loved me – the sincerity was firm – he was filled with Love. It was a true blessing which we will always cherish. But, on the evening of that day, he began to see the spirits of beloved relatives at the foot of his bed – those who had loved him and had since passed away – a few aunts and a first cousin. He told me when he was seeing them, and I asked him how that made him feel. He said, “Comforting. It gives me comfort, son, a lot of comfort.” A few hours before that, he had expressed an ambiguous feeling of fear – “I’m afraid!” – as if, perhaps, his soul had felt a certain slipping and uneasiness. I reassured him of my presence, and then came heavenly help which made all of the difference. Oh, what a blessing for him, and for us, that God was with us and sent him comforters to ease his anxiety. Dad was a truly good man, and I love him very much. He was caring and merciful, and as Jesus promised, Blessed are the merciful, for they will receive mercy [Matt 5:7]. My brother, a nondenominational Christian, asked me what should be done with the Miraculous Medal. I told him to keep it, for it had been in the presence of the holy event of Dad’s passing away to God. Brother kept it. 1 As to the coming of our Lord Jesus Christ and our being gathered together to him, we beg you, brothers and sisters, 2 not to be quickly shaken in mind or alarmed, either by spirit or by word or by letter, as though from us, to the effect that the day of the Lord is already here. 3 Let no one deceive you in any way; for that day will not come unless the rebellion comes first and the lawless one is revealed, the one destined for destruction. 4 He opposes and exalts himself above every so-called god or object of worship, so that he takes his seat in the temple of God, declaring himself to be God. 5 Do you not remember that I told you these things when I was still with you? 6 And you know what is now restraining him, so that he may be revealed when his time comes. 7 For the mystery of lawlessness [iniquity] is already at work, but only until the one who now restrains it is removed. 8 And then the lawless one will be revealed, whom the Lord Jesus will destroy with the breath of his mouth, annihilating him by the manifestation of his coming. 9 The coming of the lawless one is apparent in the working of Satan, who uses all power, signs, lying wonders, 10 and every kind of wicked deception for those who are perishing, because they refused to love the truth and so be saved. 11 For this reason God sends them a powerful delusion, leading them to believe what is false, 12 so that all who have not believed the truth but took pleasure in unrighteousness will be condemned. 675 Before Christ’s second coming the Church must pass through a final trial that will shake the faith of many believers. The persecution that accompanies her pilgrimage on earth will unveil the “mystery of iniquity” in the form of a religious deception offering men an apparent solution to their problems at the price of apostasy from the truth. The supreme religious deception is that of the Antichrist, a pseudo-messianism by which man glorifies himself in place of God and of his Messiah come in the flesh. 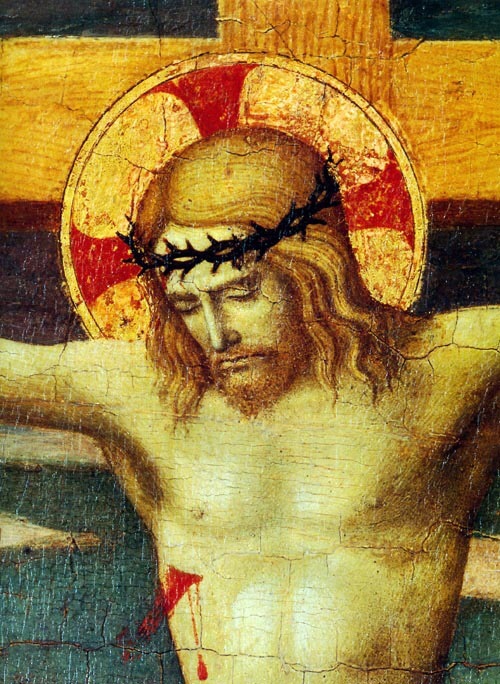 We see that occurring under the moto proprio, Summorum Pontificum (SP), and the groups of people who, blind already to Jesus in the Eucharist within the God-willed Novus Ordo Mass, seek out the fashions of the Extraordinary Form in order to be nurtured by the form and culture, not by Jesus Christ. It’s very revealing. SP was meant to be a solution for SSPX and their adherents- a cause of unity. However, it is precisely a cause of disunity (and a tax on limited priestly resources) and a complete reversal of the will of God expressed through Vatican II and Sacrosanctum Concilium. Pope Benedict XVI was deluded in this action. He has since been resigned, in good health, by God. As has been expressed before in another forum, the action called by the moto proprio, SP, if enacted during the time of King Solomon and his successors, would have been like telling the People to vacate the Temple (a unifying structure which drew Jews and Gentiles alike) and move God’s throne back to the primitive Tabernacle of canvas and tent poles with only the twelve tribes on its periphery. But here’s the catch – the great delusion: God is still in the Temple (His missioned Church according to His wishes as outlined in Vatican II Ecumenical Council), and those who refused to believe in and be satisfied by His Real Presence there, above all else, are now in the old Tabernacle (the Church He set out to reform) in direct violation of God’s wishes as expressed under Vatican II and Sacrosanctum Concilium, worshipping form and scenery and fashion and self-aggrandizing music, but not God; turning inward to the old ways but not blooming outward in a way appealing to the lost sheep and God’s appointed mission. For, if they believed in God and listened to and adhered to His call to unity and to evangelize the world and make conditions for bringing all back into the Church, they would not have left the Temple in search of “not-God.” If they heard His voice and followed it, they would have embraced Vatican II enthusiastically and with the knowledge that by obeying God’s will, we are loving God as best we can. When Jesus comes to judge, who will he condemn? Those who have faith and a spirit of obedience or those who have doubt and a spirit of disobedience? Catholic priests don’t preach against Protestant denominations. Though willfully separated, they are considered fellow Christians, dignified by baptism. All Sacred Scripture and most Protestant faith traditions came down to Protestants from the Catholic Church which was founded by Christ on St. Peter, the first Pope. We need to strive to learn and accept that there is and can only be one Church of Christ, the entire Body of which subsists in the Catholic Church, against which Christ promised the gates of Hell would not prevail (the “gates” being, among other things, the proud spirits of rivalry, division, schism, and in some cases, even hatred). At the Holy Sacrifice of the Mass today, after receiving Jesus in the Blessed Sacrament, I heard “Know Me,” and then I saw the Wound in His hand open. Light shown through, and it looked warm and incandescent. When I looked more at the Wound, the Light seemed to come from an infinite depth, and the Wound seemed to broaden. In Jesus, can you imagine the mystery of infinity inside of a seemingly finite body? It was infinite Peace in Him. “Know Me!” It was infinite Compassion. He loves us. He is Love. To prepare the Church for reunification of all of the Baptized in Christ. With Sacrosanctum Concilium and the Novus Ordo Missae comes the “fresh wineskins” which allow for the Protestant brethren, the “new wine” to return to the Church. 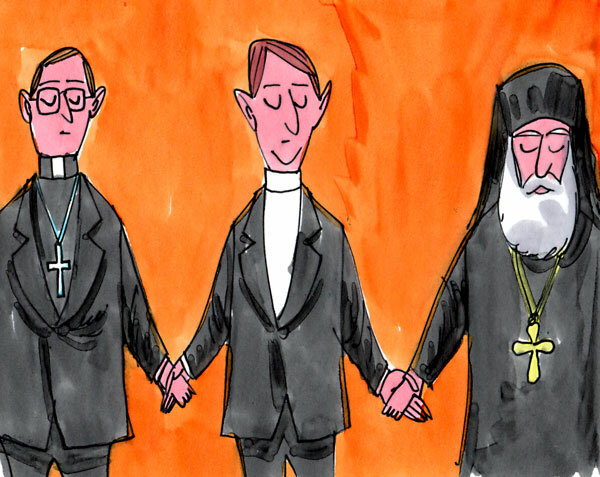 As well, the rewrite of Canon Law in certain areas (more “fresh wineskins”) may pave the way for the return of our Eastern Orthodox brethren (more “new wine”) to the Church in full communion with the Roman Pontiff. I look forward to the great “day” to come; it is coming soon. I dreamed last night that I was flying a kite, a kite which also was hoisting me along in the air from place to place. The kite is changing into a dove! I was trying to steer the kite when I noticed that it was not a kite at all. 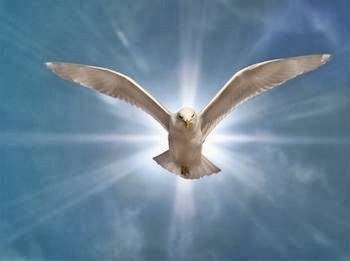 It was a beautiful white dove! Was I steering it or was it steering me around power lines and trees? As we went along, it got lower and lower to the ground and the wind seemed to slow. Eventually the dove rested on the ground and immediately became a beautiful young human being with golden hair with a white robe and reclining on the ground and smiling at me. And that was my dream. Upon reflection this morning, I thought of the Holy Spirit. While I know that the Holy Spirit is literally scripturally masculine, I could not tell whether the Person was male or female except that I can easily associate fairness and beauty with feminine traits. I suppose that when we see God, the glorified Jesus face to face, we might see both masculine and feminine traits since the Body of Christ consists of all of the Faithful, both male and female, and we all find our wholeness in Jesus Christ. The dream is important and relevant to my recent tribulations in determining my vocation in life. Am I following God’s Will or am I subverting His Will through my own efforts to control the direction I am going? But, truly, I feel directionless now – without passion for anything in particular other than stabilizing my life so that I can spend more time with God, e.g., going to daily Mass, and so on. But I am like a person on the wind which blows where it wills, and I do not know the direction in which it goes, and am I comfortable with such a disposition? That last phrase caught my attention. I am born of the Spirit in Baptism and my direction in life needs to be aligned with that of the Spirit whose direction it is not mine to grasp by my own will. I need less me and more Him in my soul. If I can just hang on in trust and let the Spirit carry me instead of me trying to steer the Spirit, all will be okay, will it not? 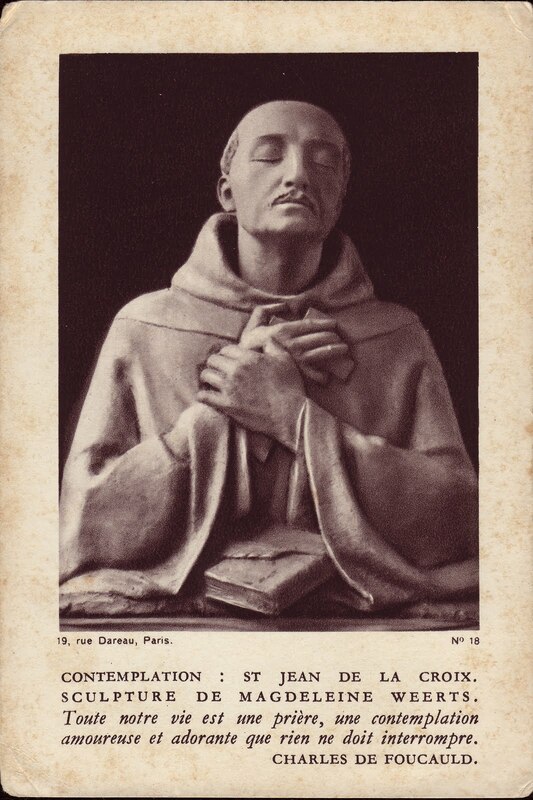 St. John of the Cross in contemplation of God. And so I need to humble myself – stop trying to steer God and let God steer me instead. This requires me to open my heart and say “yes” more to the missions He sends my way, right? And what are the missions? You see? I doubt because I am not sure what are the missions. Lord, open my heart and my mind to be receptive to your love and grace whenever and wherever you will that I may do your will and be joined to You and You to me in that close bond which is meant to be like a marriage according to your own design. Help me to hear your voice and to follow You wherever you lead me. Amen. This Divine Mercy statue belongs to the Franciscan Sisters, T.O.R. of Penance of the Sorrowful Mother and was installed on the feast of Bl. John Paul II, October 22, 2011. They have a special devotion to Divine Mercy and St. Faustina. My dear brethren who have left the Catholic Church: When you were a child, you left the Church with the fullness of pride. Now, please return in the emptiness of your humility that you may be filled once again with the rich Grace of Jesus Christ from His Font of Mercy. For His Divine Mercy endures forever for those who love Him through obedience to Him, Who is All Love for you. My dear brethren who have not yet entered the Catholic Church: The Father calls you to His humble kingdom of everlasting truth and salvific hope. For His Divine Mercy endures forever for those who seek Him in truth and who yearn to love Him in their obedience to His Divine Will, Which is All Love for you. Last Saturday night, I had 3 dreams – the last one being the most special dream. In the first dream, I was with my wife, and we were being a naturally-loving married couple. In my second dream, I was a soldier again, and I felt an intense anxiety as I was called to prepare to deploy for an unanticipated war. I actually felt a tearing anxiety in my body – a feeling of intense worry, mostly about being sure to take the right things with me. When I awoke, I calmed down and then I prayed and asked the Lord why I needed to feel such pain in my dream. And then I thought, “Perhaps I am taking on someone else’s burden – for their sake – for love of them.” I accepted this, and then I knew that the dream was good. I felt I had somehow done a good deed. In the third dream, I was relaxed and with a few other men sitting at table in an enclosed room. There were no walls but everything beyond the table was blackness – nothing. But, there was a square opening in the darkness through which light poured in from a bright blue, clean sky – the vision through the window was more real then the dream in which I was dreaming. 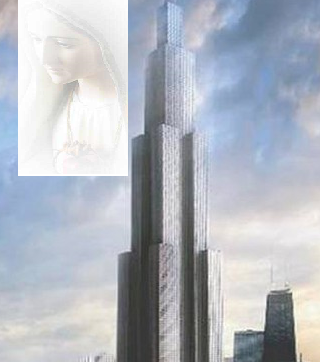 I glanced out through the window and saw a very tall white building – a huge and lofty tower, and behind the building was a white cloud. I looked down and then up and out again and the cloud had become a beautifully-chiselled, smiling Face, like that of a beautiful Asian woman (because of the eyes and beautiful Face and Asian-styled attire). But I am not sure if it was a woman or not. The Face was beautiful – like perfect white marble – and finely detailed. I called my companions at table to also look. And they agreed with what I was seeing. Then, a mist formed before my eyes along the length of that huge, tall white building, and an Enrobed Body began to form – from the Head all the way down to the base where I could see the Feet which were adorned in special shoes. The Enrobed Majesty stood, a giant beautiful Column, like a Royal Highness in front of the towering Building. This Majestic Highness seemed to be coming from the Building or mysteriously joined with the building but forming from a gently-appearing mist. My first thought was that I was seeing this vision in a land like China because of the Face and clothing. I do not yet know what to make of the dream except that perhaps I was seeing a spiritual vision of the Catholic Church in China or Mongolia. The Majestic Highness could be like the pure spirit or pure soul of that Building, the Church, and the Church could be the People who are the spiritual building blocks of that great white Building. The Majestic Highness could be like a Princess or a Daughter. The Majestic Highness could also be like a companion to that Building. But I did not know for sure. But one thing I do know for sure: the Majestic Highness is greater than the Building. he has girded himself with power. your throne has stood firm from of old. From all eternity, O Lord, you are. the waters have lifted up their thunder. the Lord is glorious on high. Truly your decrees are to be trusted. O Lord, until the end of time. This beautiful psalm reminded me of my dream, and confirmed to me that I may have had a dream from God about Himself and His relationship with the Church. What do you think?